St.Mary's Sr. Sec. 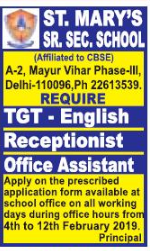 School, New Delhi has advertised in THE HINDUSTAN TIMES newspaper for recruitment of Teachers TGT jobs vacancies. Interested and eligible job aspirants are requested to apply on or before 12th February 2019. Check out further more details below. About School: St. Mary's Senior Secondary school established in. 1996, is a MinorityCatholic School under the management of Delhi Catholic Archdiocese. It serves the Educational needs of Trans-Yamuna Catholics and. all sections of the society, regardless of caste, creed or financial status. The School is affiliated to CBSE with Affiliation No. 2730473. The Students are prepared for the CBSE Examination at Class X and XII level. How to Apply: Interested candidates are requested to apply on prescribed form available in the School office on all working days during office hours.